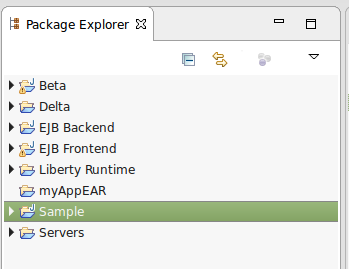 In Eclipse, select File > New > Java Project. Give your project a name, such as Sample and select Finish. In this example, a project called Sample is created. In the left panel of Eclipse, expand your project. Give your package a name and select Finish. In this example, a package named com.sample.main is created. Right-click on the package, and select New > Class. Give the class a name, and select Finish. In this example, a class named People is created. In the newly created class, add the following markup. Right-click on your project and select Export. Select JAR file and select Next. Select Browse and select a location on your local PC. In this example, the JAR will contain the People.class in the com/sample/main/ package.